The influence of a chemical composition on the phase composition, stability, and crystal structure type of the austenitic and martensitic ternary NiMn–NiTi alloys with a quasi-binary cross-section is analyzed. The temperature-concentration limits of their existence are determined. 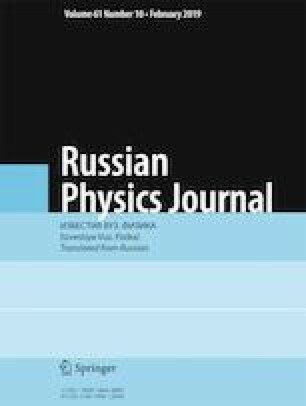 It is found out that doping of these alloys with titanium decreases the critical temperatures of thermoelastic martensitic transformations compared to those of the basic binary intermetallic compound NiMn. In the alloys, doped with more than 15 at.% titanium, phase decomposition is observed, followed by the formation of titanium-rich (Ni3Ti) ternary precipitates of the 4H-HCP type, which form a Widmanstatten substructure. Translated from Izvestiya Vysshikh Uchebnykh Zavedenii, Fizika, No. 12, pp. 103–108, December, 2018. Ni–Mn–Ti Diagram, Springer Materials at: https://materials.springer.com/periodictable#Mn-Ni-Ti.